The fall my mother once again had the opportunity to acquire another bonnet reproduction from the talented Beverly Lister of Beverly's Bonnets. Beverly has been creating beautiful millinery for many years. 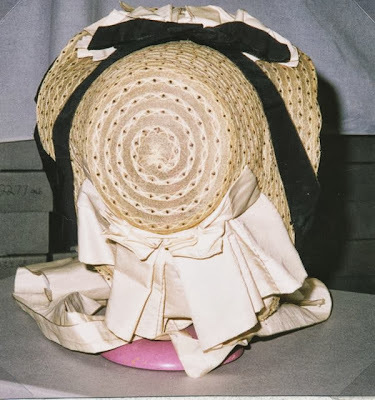 Her bonnet reproductions look just like the originals. The shape, materials and trims are always 100% authentic. 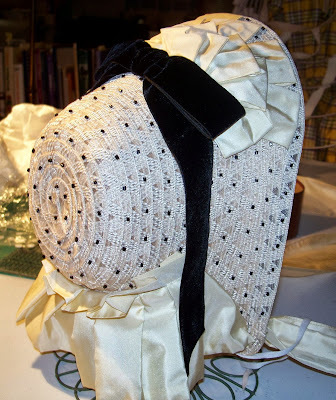 This bonnet is based off of an original horsehair bonnet seen online. Beverly created the frame from a faux horsehair and hand beaded the entire base with vintage black beads. 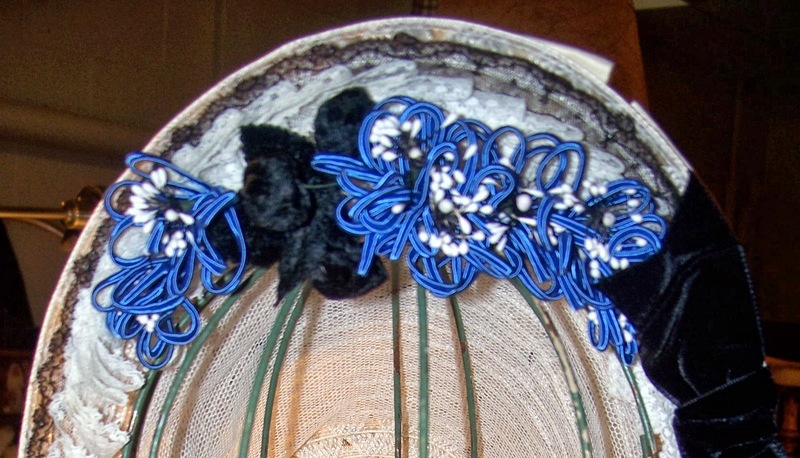 The interior of the bonnet is trimmed with layers of white and black lace and the blue flowers were hand-made by Beverly from the same soutache as the dress. The bonnet is stunning, simple, and elegant. It coordinated perfectly with the brown wool dress with soutache trim that my mother recently made, inspired by the soutache trimmed dress in "Who Wore What". 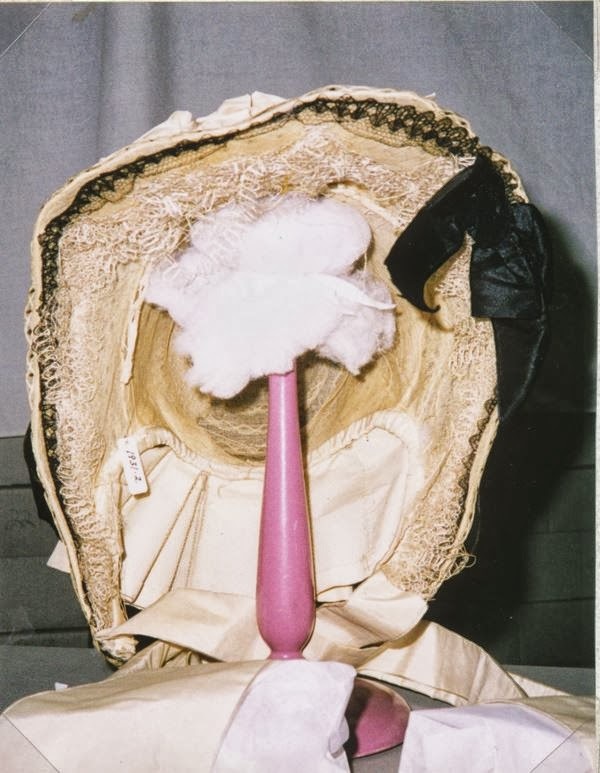 The original bonnet that the reproduction was based off of. Reproduction Bonnet by Beverly Lister of Beverly's Bonnets. Blue Soutache Flowers custom made by Beverly. 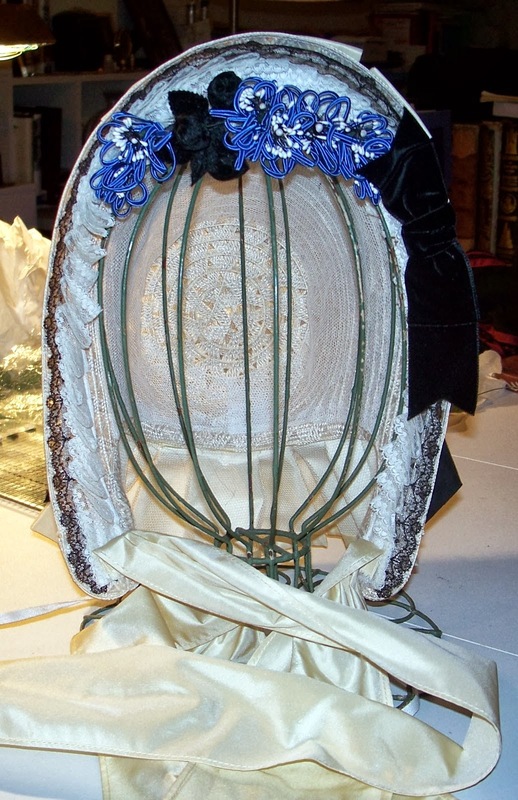 Beverly also does beautiful hairnets, headdresses and hats in both buckram or straw, as well as millinery for other eras. 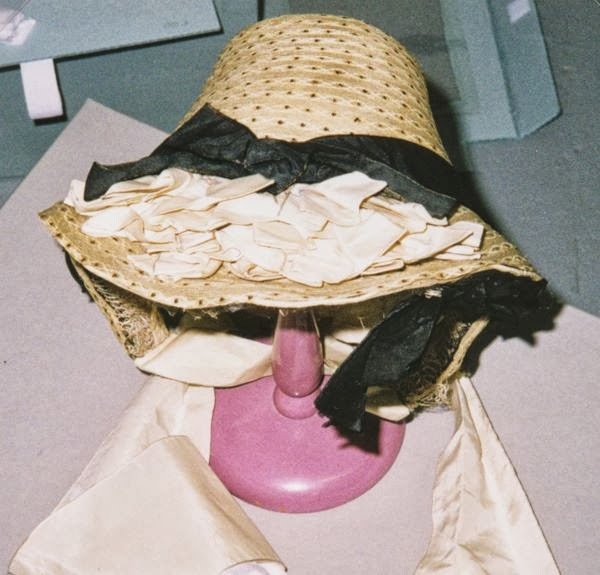 This bonnet was a beautiful recreation of the original. Beverly mirrored every aspect of the original. Your mother looks lovely in the bonnet which goes so nicely with her dress. The soutache was so nicely applied to the dress bodice and sleeves. A very attractive ensemble for sure. Beverly is so talented and I do love my two bonnets she made for me. I have had them for a long time and they have held up nicely over the years. She is the best I have found for bonnets. The bonnet looks fantastic, so well done. And I'm in love with your mom's brown and blue gown. That photo from "Who Wore What" is one of my favorites. :) I think the same design would look great in brown and red too. wow... that is an incredible bonnet, and i just love the trim on your mother's dress! so much loveliness in one outfit!